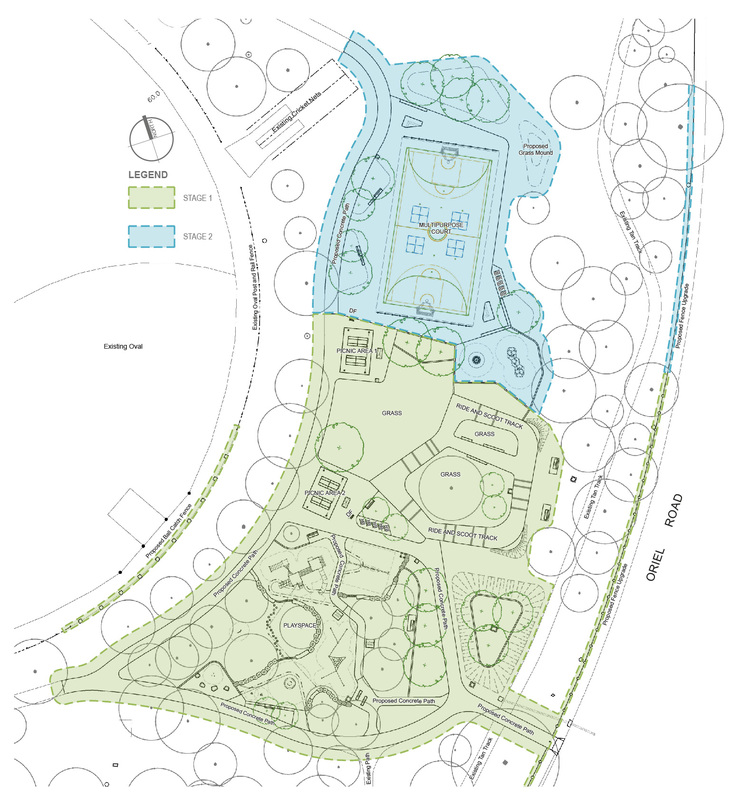 Ford Park, Bellfield is getting a new gathering space with picnic facilities, a new playground and a new youth activity area. Throughout 2016 a master plan for Ford Park was developed with input from the variety of people that use the park. If you contributed to the master plan, thank you! We are busy working on delivering each of the actions associated with the plan, a few of which you can already take advantage of or are currently under construction. Many thanks to everyone who got involved and shared ideas during the consultations. Your feedback has been used to help create the family gathering and youth space final design and construction for stage 1 will start October 2018. Funding for design, documentation and works on site is in place. Stage 2 is subject to funding - considerations about funding options and time frames still to take place. Take a look at the Ford Park master plan to learn about all improvements for the park as a high level concept. Several parts of the master plan require more detail (just like we've done with the family, gathering and youth space) before budgeting and work can get underway. Ford Park is a 9.5ha neighbourhood sporting park which has the potential to become a vibrant local park accommodating the formal sporting activities but also the informal passive and active recreation. Ford Park is located within Bellfield bordering Ivanhoe, an area which is experiencing significant change and growth. The changes in this area are expected to continue well into the future and has reinforced the need for a master plan. The Ford Park master plan was prepared in consultation with a wide variety of users and other interested stakeholders. The intention with the master plan is for Council to deliver prioritised improvements over time based on identified goals and actions. The Ford Park master plan is made up of key objectives that are expanded upon by meeting goals that are delivered through individual actions. The summary, objectives, goals and actions are all listed on this page. If you'd like to read the report associated with the master plan including all actions, open the full report to get more detail. Remove the existing playspace near the grandstand which has reached the end of its useful life. The playspace lacks interest and does not meet the expectation of playspaces today. Provide a new “neighbourhood” playspace east of the northern oval which caters for a range of younger age groups and comprises a diverse mix of play opportunities and experiences. The playspace should be consistent with the objectives of the Public Open Space Plan in providing for nature based play activities as well as new play equipment. Shade should be provided utilising existing and supplementary tree planting. The playspace should be located within reasonable walking distance and proximity to public toilets and change facilities. A barrier fence should be provided on the Oriel Road side of the playspace concealed within garden beds. Provide picnic facilities within a close proximity to the playspace comprising picnic tables, shelters, electric barbecues, bike rails and bin enclosures. Incorporate exercise stations in association with walking trails and pathways to promote intergenerational health and fitness usable by all members of the community including the elderly. Three fitness stations should be located in the park: one each in the north, and south close to park entry points and one near the playspace / social hub. Remove the existing basketball court. Provide a new multipurpose court line marked for netball, basketball and other ball sports if required. Provide a hit-up rebound wall with tennis net and other ball game line markings. Consider the inclusion of a practice golf cage behind the cricket nets. Provide youth spaces comprising of picnic tables, seating and protective shelter where teenagers can meet, socialise and study. Provide outdoor ping-pong/ table tennis, bouldering and parkour elements to encourage the activation of spaces by teenagers and adults. 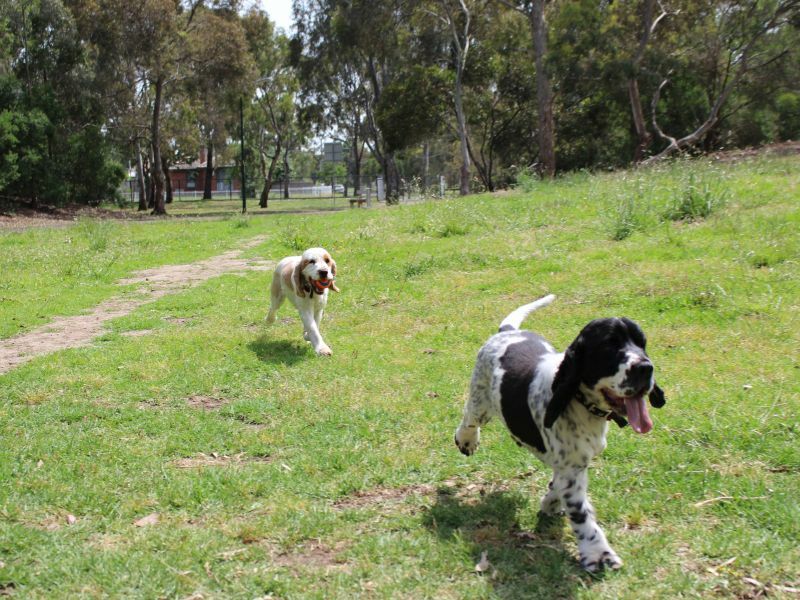 Provide a dedicated dog off leash area between the planted mound and Council depot in the south-west area of the park. New fencing shall be concealed within existing and proposed garden beds to lessen its visual impact. Entry gates to be provided at the north and south end. Drink fountains with integrated dog drink bowls are to be incorporated into the space including dog litter bag dispensers or signage advising dog owners to take home their litter. Replace existing asphalt pathways with a 2.2m wide ‘tan track’ (primary path) comprising compacted gravel paths to circumnavigate the park with connections to/from park entry points. All secondary paths will be 1.8m wide comprising the same material. Install and distribute new seats and drink fountain evenly across the park. As Oriel Road is a declared VicRoads road, investigate with VicRoads opportunities to improve connectivity and safety for pedestrians and cyclists. In particular, access across Oriel Road to Ford Park in key entry locations opposite O’Keefe Street and Perkins Avenue East. Corner of Harrison Street and Davidson Street. Park entrances will comprise park identification signage, garden bed displays, feature paving and casual seating. Develop a wayfinding/signage plan for the park including distance indicators for walking / running. Provide a safe pedestrian crossing within the car park with outstand islands. 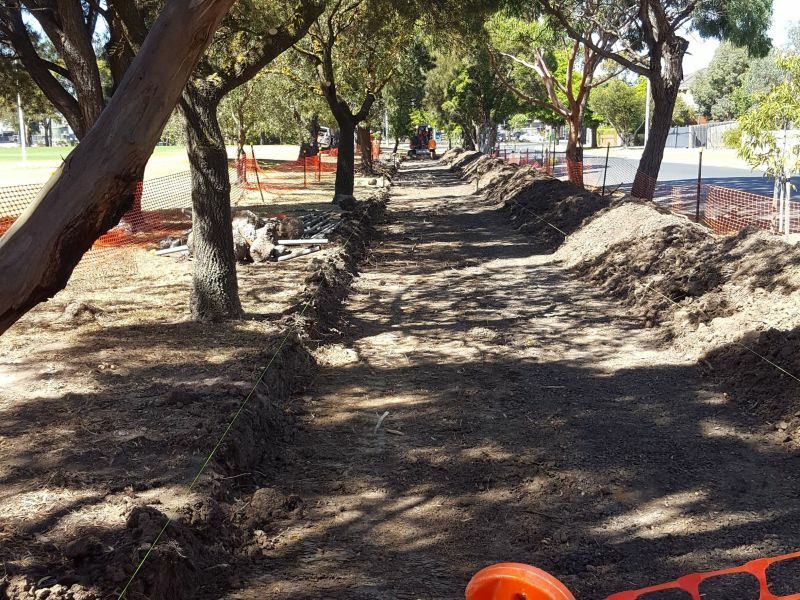 Investigate provision of footpath along the south side of the Council Depot to improve the link from the Darebin Creek to Ford Park. Remove the existing and outdated steel post and pipe rail fence around the park. Consider replacement with bollards or a timber post and pipe rail fence to prevent unauthorised vehicles entering the park. Provide park lighting along pathways to improve safety and the use of park facilities the ‘tan track’ and fitness stations at night. Strategic lighting plan to be developed. Remove redundant light poles which fail to illuminate pathways i.e. the light between the sports ovals. Maintain clear sight lines through the reserve using high canopy trees and low shrubs incorporating Crime Prevention Through Environmental Design (CPTED) Principles. 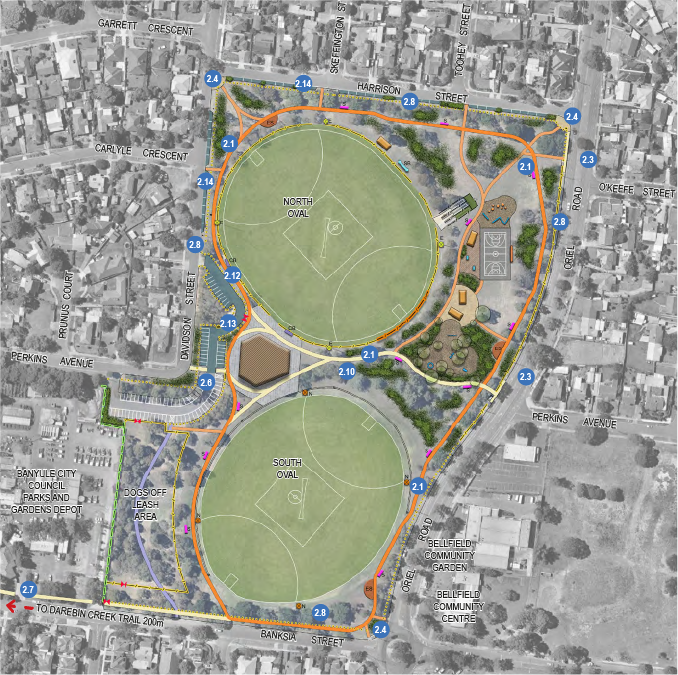 Remove car parking facing the northern oval to facilitate the construction of the ‘tan track’. Provide a connecting internal access road between the northern and southern car park. This could also include drop off/pick up zones. Undertake in conjunction with pavilion planning a Parking Study to assess whether 90 degree parking can be achieved along Davidson and Harrison Street to address any increase park usage by sporting clubs and minimise impacts on surrounding residents. If not, provide indented parallel parking along these streets. Gradually phase out environmental weed species such as Ash and Pine and other exotic trees as they near the end of their safe useful life. Simultaneously undertake succession planting using indigenous/native tree and under storey planting. Remove senescent and/or deceased trees and replace with indigenous/native varieties. Add additional tree planting along pathways and social gathering spaces for shade and spatial definition. Trees assist in controlling solar access and create much cooler environments particularly in summer. Investigate the inclusion of raingardens and vegetation swales within the existing and new car parking areas in order to reduce nutrient loads and suspended solids entering the stormwater catchment. Northern Football League and Council to work collaboratively in establishing a primary winter tenant (AFL). Remove the existing grand stand as the facility is run down, aged and unable to be expanded upon to increase the number of male, female and umpire change rooms which would otherwise attract a permanent winter tenant at the park. Remove the existing public toilet building. Construct a new accessible multipurpose community hub/ sports pavilion to be shared by cricket and football clubs. The pavilion would be available to other community groups with an accessible public toilet facility attached to this building to service increased community use. The sport pavilion will be skirted with spectator viewing areas and terracing where slope allows, including an entry plaza from the main car park. Provide additional sports lighting for training purposes. Retain the openness (unfenced) character of the southern oval for community festivals, events and general casual use. Remove the existing pipe and rail fence around the oval and replace with a 1.2m high black PVC coated chain wire fence. Integrate into the perimeter fence a black PVC coated chain wire ball catch fence behind the goals at the Oriel Road end to prevent footballs entering the playspace. Provide coaches boxes for home and visitor teams integrated within the boundary fence. Provision for an additional cricket practice net as and/or if the cricket club grows. Consideration should also be given to potentially abandoning the current location relocating/reorientating the practice nets north-south. Provide an even distribution of litter bins around the park, particularly along pathways, at entry points and social gathering spaces. Ensure the placement of bins is undertaken in conjunction with rubbish collection contractors. Provide maintenance access for ride on mowers and utility vehicles to the north and south of the park including the enclosed dog-off leash area. Consider the use of locally available landscape and building materials for replacement and/or top up. Consider the use of materials which have a longer life span such as renewable and recyclables, plastic-wood composite products and steels. Provide a new steel cage enclosure over all water meters. 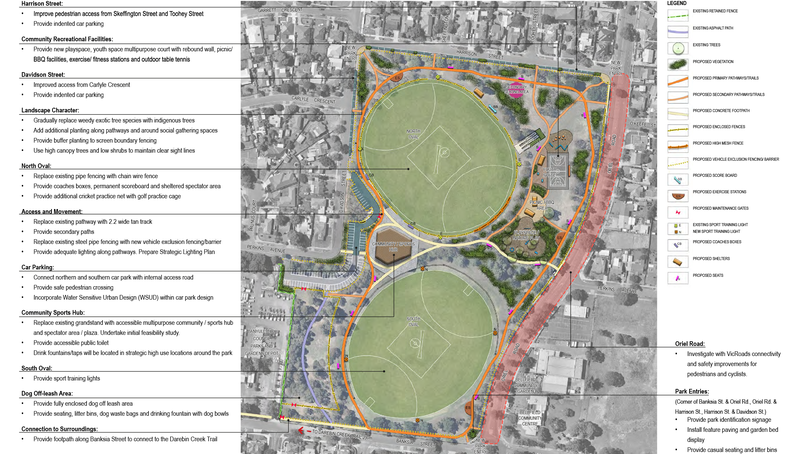 The Ford Park Master Plan was adopted by Council on 19 September 2016. What sort of family, gathering and youth space do you want? Get involved on this page and let us know the what, where and why for a new family, gathering and youth space at Ford Park. We'll even be at the park so you can tell us in person. Using your feedback a draft concept of the family, gathering and youth space design is published. Your feedback on the concept is welcomed. Considering all your feedback on the draft concept we'll refine the design to create the final concept. The final concept design will be published and used for Council's budget process.